??? 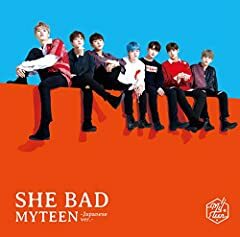 MYTEEN - SHE BAD Official M/V Korea's No.1 music distributor GENIE MUSIC official YouTube channel. ???? ?? ????? ???? ?? ???. MYTEEN is on Purple LIVE! Check out the boys in a Close Up view #Mubeat for more #KPOP videos! https://mubeat.page.link/4Mnn. 180724 ??? ??? ?? &#39;SHE BAD&#39; MYTEEN Kim Kook Heon Fancam @THE SHOW @?????? @?? By ?? 10? ?? ?? ??? ??? ??????? ??? ????? ?? ?.